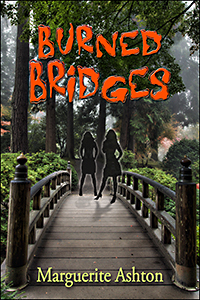 Author Marguerite Ashton is pleased to announce the release of her new mystery novel, Burned Bridges. Sealed by a shared bond, and unaware there is more to the secret than what she was told, Collins feels honor bound to protect her friend when a confrontation between Olivia and her childhood tormentor turns deadly. “The dialogue is excellent and the plot is well-done with a compelling ending.” – Renata F. Barcelos for Readers Favorite. Burned Bridges was released in November, 2012 and is currently available from Amazon.com and Amazon UK.